From here, you can explore my shops, learn about new trends, see recent creations from my studio, hear about my day, or maybe just enjoy a nice picture I am sharing. Come back often! After admiring these "plate flowers" for a while I jumped in and made some. This was lots of fun!!! I used E6000 glue to join the plates, saucers, candleholders, glass drops, etc. On the back I glued a flattened cheap spoon with the handle down. The handle sticks into a piece of plastic conduit that is reinforced with an old scrap of rebar inside. Give the glue plenty of time to set up (maybe as long as a week) before putting them on the stakes. I have to warn you...this can get addictive...I made a lot more than shown. Have fun if you try it!! How about coordinating pieces by theme, as in these Fleur de Lis earrings with the Eiffel Tower? Hope you are all having a wonderful Spring season. I am! This first one features a brass chain and rose toggle clasp, with dripping pearls below the cameo. I decided on black ribbon and an antique screw clasp for this one. The black crystals contrast nicely with the pearls, don't you think? On the last one, I made the necklace part of pearls and rose design spacer beads. Then I fashioned a wire clasp and a retro linked-beads extender for a unique finish. The pearls are linked to form a loop below the cameo. This was a fun time for me! Some fellow crafters and I are participating in a blog hop for the next few days. We will be featuring sales, new items, specials, and more. Look for the shop links in the comments below and visit their stores! We all have shops on the new UK platform "SupaDupa". Let us know what you think! My shop is http://www.mckenziecreekjewelry.com and I am offering 15% off through Valentine's day! Here's a new item in my store: Only $12.00 for the two piece set, BEFORE your discount! 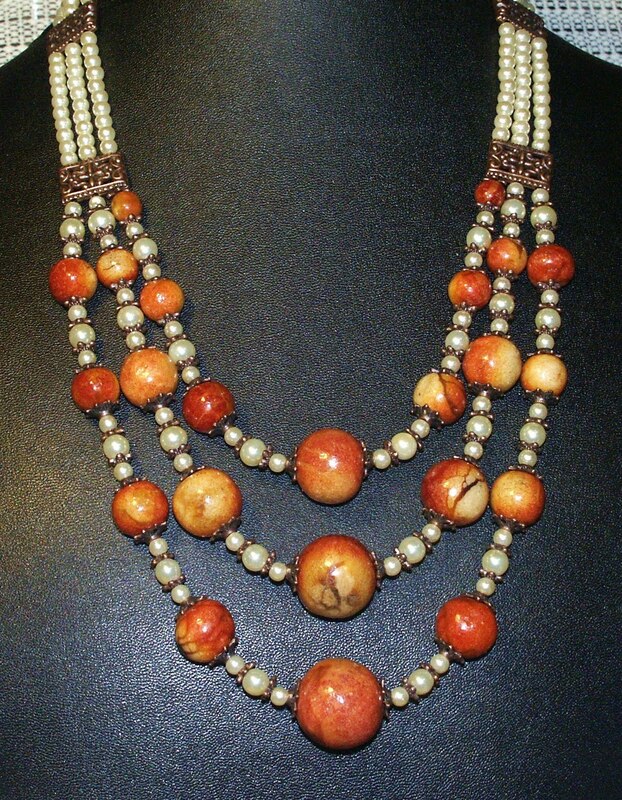 I recently learned about a wonderful boutique designer named Leona Caldwell. She made her own ceramic pieces, used in jewelry and belts, based on ancient Hohokam Native American designs. The reason I discovered her is below. Amongst my grandmother's many collectibles, some of the "discards" going to charity were set aside for me to look at (possibly for jewelry making). This signed designer belt was included...I am so glad I got it instead of a thrift store! Yay! There are 3 different poses of the baby quail in the belt, all are shown here. Her signature appears on only one piece. The entire piece...the leather is stuck now but still pliable. Not extremely well known, Leona Caldwell is still quite collectible. In addition to her ceramic pieces, she also designed (and handmade) dresses and jackets that incorporated the Hohokam designs. Some designs featured agave, opuntia, owls, phoenix, eagle's eye, quail, and cone flowers. "Leona H. Caldwell drifted into death April 19, 2003. She was born Leona Holly May 31, 1912, on a farm near Peoria. First of five children born to Bob and Bessie Holly, she was last to survive. Married in 1933 to Ralph W. Caldwell, Jr. she had two children, Ralph and Pat. While Ralph Jr. was in the Pacific (WWII) she returned to Arizona State Teacher's College in Tempe to study art. When her husband died in 1954, she expanded her ceramic studio in Phoenix and soon opened Leona Caldwell Originals in the Kiva Craft Center on Fifth Avenue in Scottsdale, neighbor to fellow artisans Lloyd Kiva, Charles Loloma, Paolo Soleri and many others. She created ceramic jewelry and garments silkscreened with original designs inspired by Hohokam artifacts, animals and plants of the Southwestern desert. She retired in 1978 to enjoy her home, garden, and family. In addition to her two children Ralph W. Caldwell and Patricia L. Konomos, she has five grandchildren: Kevin Higgins, James Konomos (deceased), Karen Markland, Anastasia Konomos, and Ralph T. Caldwell. She is great-grandmother to eight and beloved aunt and friend to many. She will be remembered by all for her creativity and moral example, and missed for her generosity and love. " Hello Everyone! We had cauliflower crust pizza last night! It's January, official dieting kickoff month. This year, my husband and I are actually enjoying our new diet plan. So many folks were touting the low carb results that we have tried it and are big believers in it too! What does this sort of diet mean? Well, it is a bit like Atkins, but updated. By restricting carbohydrates to very low levels (20 grams daily or less for the first 2 weeks, then gradually increasing the amount each week to a maximum of 100 grams daily...if that does not make you gain weight). This changes your metabolism to one that burns fat instead of carbs; a condition known as ketosis. It is very important to drink lots of water because your body will be flushing out ketones during this time, and you may suffer from dehydration-related muscle cramps if not drinking enough fluids. I have found that I need to restrict my caffeine intake somewhat as well. What do we eat? Lots of protein (meat, nuts, hard cheese), real butter, full fat dressings and oils, vegetables (green beans, broccoli, carrots, tomatoes, peppers, onions, lettuce, radishes, cucumbers, cauliflower, spinach, kale, and other low carb selections without added sugar), fruit (a few berries, cantaloupe). Splenda, Truvia, Erythritol, and Stevia are all allowed, as is real heavy whipping cream. What do we avoid? Grains, sugars, starchy foods. This list includes pasta, bread, crackers, soda, sweets, peas, corn, beans, potatoes, breaded foods, and most fruits/juices. There is a wealth of information on what to eat and what to avoid. Overwhelming, actually. We are just sort of making our own decisions based on glycemic index ratings and personal food preferences. A fascinating new book (Wheat Belly by Dr. Davis) postulates that modern wheat and other genetically modified grains are responsible for the obesity epidemic we are currently experiencing around the globe. Gary Taubes' book "Why We Get Fat" has a lot of great data to back up the low carb way of eating. Anyway, how is it working? I have lost 15 lbs, hubby 16 since late October. We probably would have lost more but cheated some during Thanksgiving and Christmas (me especially! Pecan pie and cookies). The single greatest thing about the diet is that we don't get hungry!!! It is like a secret liberation from appetite swings. The carbs cause your body to release insulin, which locks up the calories in fat cells and stands guard to make sure you don't use that fat. By switching your metabolism to ketosis, the opposite occurs and you begin to burn that stored fat. Hallelujah! I am not an expert on nutrition, and this web post is not meant to be a guide to your own eating choices. Be sure to read up on this before launching into it. Happy dieting everyone! Have you heard of Supadupa yet? I just joined up last month...they had a terrific, hard to believe offer of "free for life" premium plan if you made it in by Dec 3 and I did! I still have to work on my shop there, mostly adding new items, but it is great with all the different themes to choose from, lightbox for large photo closeups, etc. They are based in the UK so some things are sorta weird to us...like calling categories "collections" and banners "logos" and flashing commercials "banners" but there is lots of help available in the help/support section by using the search feature. Oh, the greatest thing for me (besides no $$$$) is that I was able to buy my domain name and use it for the web address. 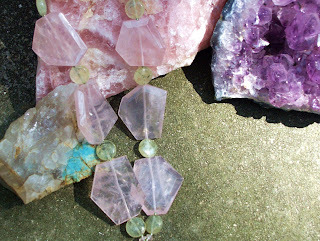 Anyone who types in (or clicks on) my domain name (www.McKenzieCreekJewelry.com) will go straight to my supadupa store! For now they are only taking Paypal for payment methods (remember that it is NOT necessary to set up a paypal account to pay with a major credit card) but they have promised to offer more payment methods in the future. There are still a few quirks in the themes. I chose "pawpaw at night" and some of the pop up circles that show the price and item description are appearing on the wrong pictures but hopefully that can be ironed out soon. Check it out soon! http://supadupa.me/ They still have a free trial going on...not as generous as what I got, but worth looking into. Here's hoping this platform gets noticed!!!! Oh Dear...almost Christmas and we are all scurrying about trying to shop, wrap, clean, cook...oh, and sell. I got pretty busy and really neglected this blog page...so sorry! Really not a lot to say except that the grandbaby is coming for his first Christmas and I am so excited about it. Made a few custom orders this month, including a watch. Pictures taken but not unloaded from the camera yet. Let's see if there is anything new I can share with you today. Here's a brooch I made with a resin rose. I like how it turned out. Well, better go for now. Wishing everyone a very happy Christmas Season and a wonderful New Year! Sorry I haven't written much lately. After my trip I did a lot of housecleaning, haha...then yardwork, then bustling around getting ready for our annual Ozark Heritage Festival October 14 & 15th. I sold jewelry both days, did twice as much business as last year. I was by myself, so it was pretty tiring. I made various trips to: doctor (with Hubby), dentist (temporary crown on my tooth), nursing home (grandma back from hospital). Spent last weekend cleaning out our "woodshed" even though I was sick with a very bad sore throat. I've been sick for a week now; I hate that!!! So....I did get to make some jewelry during all that time and I will post some pictures today! Yay! Above are some antique brass & crystal earrings. I love these beadcaps. 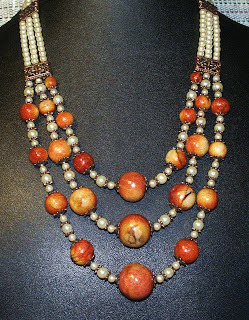 For this one, I used 3 strands of chain (2 copper and 1 gold) to form the necklace for a slice of agate. It is more sparkly than the picture shows. I also made a bunch of Christmas jewelry, such as these Dove Earrings. Made 3 necklaces with similar charms and crystals. And about 2 dozen pairs of Angel earrings! This is one style, I made a lot of other colors and some with crystals, etc. The first one is picasso jasper, the second one has "Montana Blue" crystals. I am having a wonderful time with my daughter and grandson this week. He is learning so fast. We are spoiling him rotten of course. He gets his third round of immunizations today...dreading that. Right now he's having cereal and beets, with a bit of formula mixed in. I have to confess I miss my jewelry making; but I thought a break from it was due. I really want to spend every minute I can with Gunner Kane, since it will be over next week (until I return for more). Long distance grandparenting is not ideal. Well, off to the doctor's office! Well, I got rained out yesterday...sales were good for the hour that it wasn't pouring rain! All my jewelry got wet, tags ruined, tablecloths soaked. Yuk. I had to pack up and leave once the rain let up enough to do so...everyone else was leaving too, since more rain was coming. Now, we needed that rain really bad so I can't complain too much. As for the hand-crafted only business? Ha! The lady right in front of me set up with cheap Chinese junk jewelry to resell. I am so disgusted with that. Should I join in? It seems to do well money wise, but never mind that it will fall apart tomorrow and no telling what sort of toxic chemicals are in it. That's it for today, gotta pack to go see that precious grandbaby boy!!!! I'm going to try a new venue tomorrow, Sept. 17, for selling jewelry in person. It's at Van Buren, MO (the courthouse square). This event used to be called the Van Buren Arts and Crafts Festival, but it is now run by the Missouri Extension Council and is called the Carter County Fall Festival. I sure hope the weather is great and the crowds are wonderful. Last time I participated in a "hand-crafted items only" event, many vendors were selling made in China junk. That is a turn off for many who come looking for unique items. I will ONLY be selling items I made. In addition to jewelry, I will have gift items such as bookmarks, keyrings, decorative fan pulls, and zodiac stones. Start Christmas shopping now and have a serene December while everyone else frantically shops the leftovers! Behind the slabs of rose quartz are amazonite (aqua), chunk of raw rose quartz, and amethyst. Aqua Terra Jasper: this stone comes in vibrant shades, such as this one, or in more delicate shades. 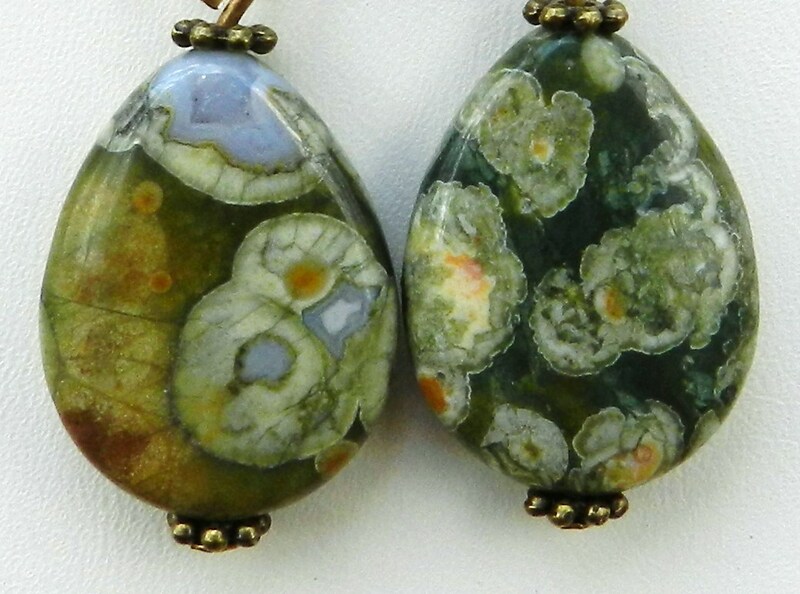 It is also referred to as Impression Jasper, or Sea Sediment Jasper. 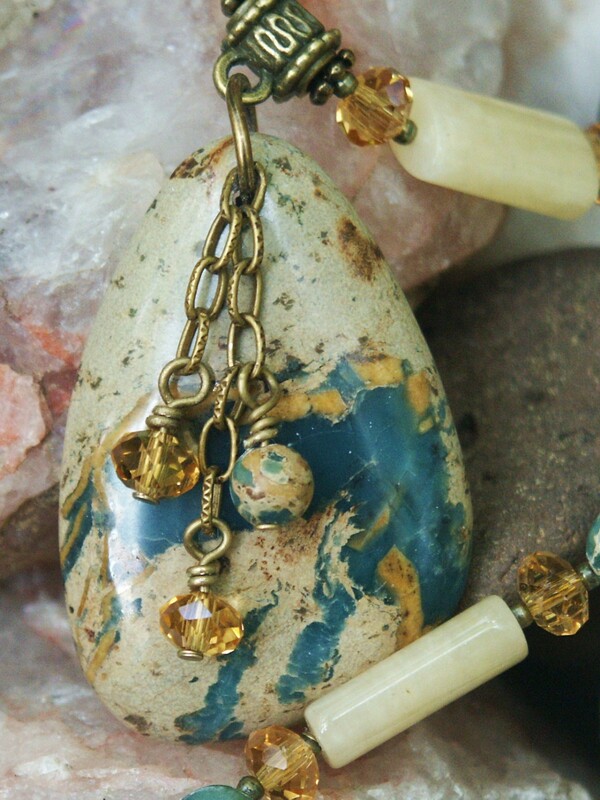 I combined it with cream quartz and golden crystals, along with antique brass metal components. Serpentine...so many types are available. 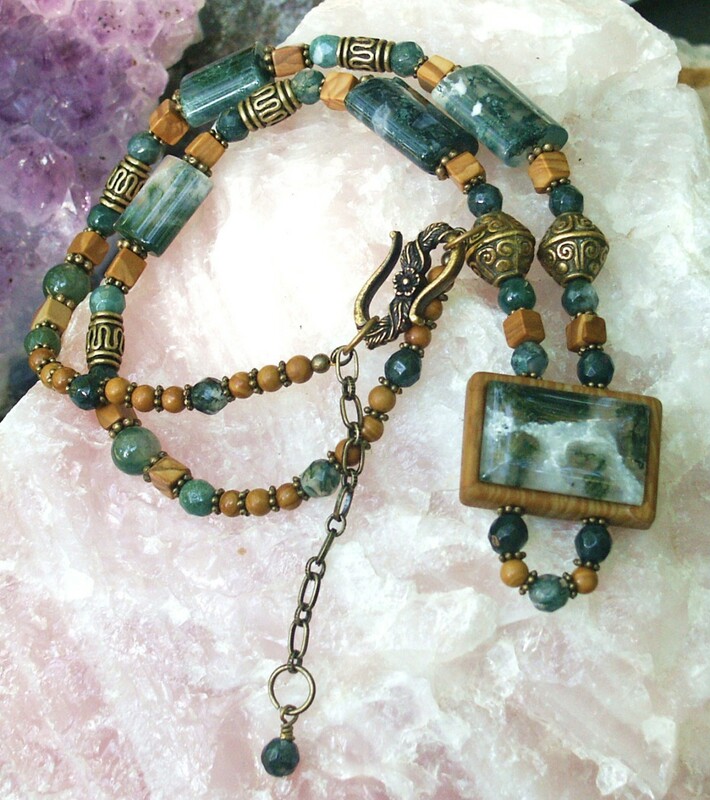 This one is referred to as Rainbow Jade, or Antique Jade. Serpentine is relatively soft, and should be handled and stored with some care. These pieces are all in my personal collection (all designed and made by me). Thanks for looking! I started jewelry making because of my love of stones. Crystals, pearls, metals...I knew about that kind of jewelry. But when I realized that the average person could obtain gorgeous real stones..already polished, shaped, drilled ...each one unique...I became passionate about it. Recently reflecting upon some of my favorites, I decided to share a few with you. Turquoise...this piece has some greenish tint to it, and brown inclusions. The diagonal stone on top is a type of chalcedony referred to as "green opal". I have lots of others to tell you about in the next edition! Time is up for today. Thanks for browsing. My daughter loves the vintage jewelry style that is so popular right now, and she recently acquired a relic to fashion into either a necklace or bracelet. So I added this old vintage chain and clasp, along with some new bead caps and purple crystals. What do you think? She hasn't seen it yet....shhhhh! Recycling/upcycling old pieces into something new is not only a good thing for the environment, it can keep a favorite piece usable, or convert something that was Grandma's into an item that a teenager wants to wear. Oh, P.S. I knew the weatherman was lying! We got a barely discernable mist. But it is cooler, that's nice. Hope everyone is having a nice Labor Day. Yes, the weatherman just keeps promising rain and cooler weather. Now it's supposed to be tomorrow. Do you think so? Well, eventually it will be cold and wet; it always gets there. I live in a riparian water rights state. That means if a body of water runs across or under my propery, I have the right to tap into it and use it (as long as I am not polluting it). That has been great! I have a submersible pump in the creek and lavishly water my flower beds. Or, it WAS great. The water is so low now there is just a trickle, so my poor plants have fallen on hard times. I've had to choose who gets to live and who has to die (or at least go into an early dormancy). I guess when it cools off, I will just cut back all the nasty dead stuff and wait for next spring! Feeling empathy for all the flower lovers, wild critters, and farmers down in Texas this year. Remembering earlier this year: some giant tomatoes in the background. Love these black-eyed susans; they volunteer every year. Enough for today. Better go water the potted plants before it hits 95 degrees outside! Ahhh Autumn! Well not quite yet, but close! It finally cooled off a bit today, but still no rain. With the drought turning the leaves yellow it has me feeling like Oktoberfest time. Is there anything so nice as a crisp day with an azure sky and rustling leaves of warm hues all around? Well, probably, but I am looking forward to it. Here is a nice scene from my back yard a few years ago to get you in the mood. Blog work done! Added 3 widgets and this episode. Kinda fun! Testing this out, let's see how it goes! Haven't done anything today but mess with the computer. Setting up this blog, tweaking a few titles on Etsy and Artfire. Need to go out and water the perennials...so dry here! Hmmm, wonder if I can attach a picture to this? Guess so! Wow that was easy. Think I should make a pendant on a chain to go with these earrings, or something fancier? Better stop for today. More work needed on this later. Must bookmark the site. 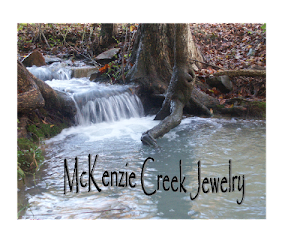 My newest shop is at www.McKenzieCreekJewelry.com and I would love for you to visit. Prices are a bit lower than Etsy due to lower fees for now. Also have some items on sale! Just click on the picture in the box below to get there. Thanks! Click to see my newest shop! Wife, mother, and grandmother who has always enjoyed the small pleasures of life like the smile of a child, the fragrant blooms of summer, or a great home-cooked meal. Other Posts by Me, in case you missed one! Photos and text are the property of Susan Gammons. All rights reserved. Awesome Inc. theme. Powered by Blogger.